In a previous Linked-In blog post, I wrote about the advancements we’ve achieved with Philips Luminous Patterns, a product solution for embedding patterns of light into wall and ceilings to create distinctive architectural experiences. In this post, let’s look farther ahead to see how the fusion of light + architectural surfaces will create new applications of light in the built environment. What is the need for new applications of lighting? Tired old lighting archetypes: Discrete objects that blast light onto passive architectural forms are not compatible with the advancements in architectural design and construction, such as parametric design. Hanging a decorative chandelier or wall sconce in a Frank Gehry or Zaha Hadid building just doesn’t work – traditional ornamental motifs and staid technical lighting archetypes don’t fit these cutting-edge spatial experiences. Light impacts health and wellness: New awareness of the health impacts of light mean that architectural lighting can be used to precisely impact an occupant’s mood, energy level, or focus. The opportunity is enormous, but the application of light must be completely rethought to maximize the potential benefits. Buildings are becoming physical portals to the virtual world: The Internet of Things, coupled with digital displays, advanced lighting technologies, and fully “connected” building systems, means that buildings act more and more as a threshold between physical occupants and virtual actions. But how does this interaction manifest itself? What technologies are driving this fusion of light + architectural surface? Haitz’s Law: Ever-cheaper, ever-smaller, ever-more efficient LEDs are at the heart of current advances in lighting applications, leading to new forms of light engines that were hard to imagine even just a few years ago. Flexible light engines: Flexible electronics and e-textiles are radically changing the physical construction of what is traditionally considered a “light fixture”. For example, LED strip lights have exploded in popularity recently – but what are they…a bulb or a fixture? Neither – they’re something more akin to a thread woven into the architecture, a light engine begging to be integrated directly into complex architectural details. Similarly, flexible planes of light can be laminated onto surfaces, into retail displays, sculptural pieces, etc. to create broad, seamless luminous surfaces. E-textile fabrics with integrated LEDs beg for creative new application in furniture and other soft surfaces in architecture. Printed light engines: Digital fabrication of electronics, such as with conductive inks and adhesives, opens up the very real possibility of bespoke light engines. Customization of building materials is common for almost every other component in a building, yet lighting remains stubbornly rooted in pre-defined, pre-manufactured “lamps” and “fixtures”. The ability to create not only custom-configured fixtures, but truly customized light engines is key for integrating luminous features into complex architectural projects. Also, advancements in optics, such as sheet diffusers, flat collimators, 3D printed optics, etc. will allow ever-thinner luminous planes of light to be developed in a customizable package. What innovation opportunities are presented by “embedded lighting”? Light-as-a-building material: Creating an elegant luminous building material that is as efficient to work with as other common building materials will be the leading area of innovation once the raw technology settles down. Historically we had lamps (“light bulbs” by common parlance), which were built into fixtures, which themselves were built into architectural surfaces. Embedded lighting holds the potential to flatten these three levels into one finished architectural surface that emits light in whatever visual format is required. But the prosaic demands of architectural construction remain, and the devil is in the details: Successful embedded lighting products will carefully refine how the product is wired, cut, trimmed, edged, mounted, aligned, etc. For example, most LED strip lights can be cut to length in field. And certain flat sheets of light already can be cut in-field to fit as-built conditions. The art of luminosity: Luminosity, contrast, pattern, and visual dynamics bring spaces to life in a more natural, appealing way. The historic modernist desire to achieve uniform, homogenous interior illumination is misguided and leads to smothering, oppressive environments that no one wants to suffer. Designers need to embrace the element of time and the variability of digitally controlled lighting to create a dynamic palette of light effects, tailored to each style of application. When lighting is fused into the surfaces that surround us, there is a huge area of innovation waiting to create novel optical effects, material hybrids, animation, etc. Wrapping a space in healthy light: As LED technologies are developed that let’s designers tune the spectral content for blue light and other critical frequencies, it becomes a very real notion that the surfaces that surround us will actively help us wake up and stay alert, or conversely, relax and chill out. UX design: If a building is a portal to the virtual world, what is the function of this connectivity? What is the experience of interacting with the virtual content? How does the dynamic nature of the architecture and lighting respond to changes in occupancy, user interaction, weather, season, digital content streams, etc.? The UX concepts vary wildly amongst the applications: A healthcare facility has very different experiential needs than a fashion retailer. How to use embedded lighting today? The old fashioned lightbox: Bespoke integration of standard light sources and fixtures (today most typically LED sources like linear cove lights or flex strips) into architectural light boxes, faced with some form of finished architectural surface. This is the way it’s been done for decades and remains the most common technique. Also in this category is the growing use of low-cost, semi-stock internally LED lit advertising signage boxes, with a digitally printed fabric facing and “trimless” surround details. The custom approach: Using LED light engines in highly customized architectural details. An excellent example is the Direct TV HQ project by Electroland, which uses the Philips Color Kinetics “Flex” product line in a totally wild custom-fabricated design. The solution approach: Complete luminous architectural surfaces that are delivered to a job site, ready for hanging onto the structure. 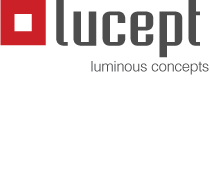 My company, Philips Lighting, has explored this area quite extensively, offering on the market our Luminous Patterns, Luminous Carpets, Luminous Textiles, and OneSpace product lines. What is the future for embedded lighting? BIM integration: Clearly, embedded lighting depends on the advances being made in Building Information Modeling. Companies will deliver tighter integration during the specification process between embedded lighting materials and the BIM model, driving huge coordination efficiencies through the bidding and “shop drawing” process, fabrication and onsite installation. Lighting simulation directly in the BIM model will eventually allow for photorealistic previews on programming and commissioning options. On site digital fabrication: Innovative new machines will quite literally print, cut and bend panels of light using cartridges of raw materials. Imagine a lighting supplier rolling up the construction site with a “factory in a box”. Instantly the size and shapes of the embedded lighting materials are sync’d with the cloud-based BIM model, of course updated with the current as-built changes. The digital production rig will print the various custom-sized panels in proper installation order, tremendously reducing logistics costs. Hopefully these concepts are enough to get everyone excited about the potential of fusing light + architectural materials. Along with Connected Lighting and Sustainable Lighting, Embedded Lighting is one of the core areas of innovation that will drive the Next Evolution of Lighting.